Elkagorasa the Casual: Legendary Acquired! In the 8 something years playing Warcraft, this is my first Legendary. The single reason why this was possible is the LFR. 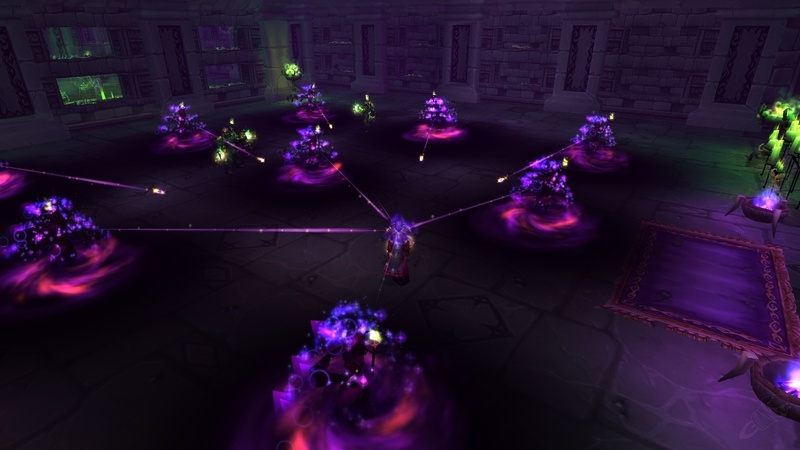 Without the LFR, I wouldn't been able to get into enough raids to gather the stones, secrets and runestones to complete the quest chain. Last weekend, I had 11 of the 12 necessary Titan Runestones. With this, I only queued up for Halls of Flesh-Shaping and luckily I got my last stone from the first boss (Durumu). Lei Shen was easy as usual. Quick three bosses and back to talk to Wrathion. Purple i600 cape is now on my back. Challenge of the Celestials. Ugh. Not easy, but not the green fire PITA. I was able to finally win the fight after about 7 tries. In this you have to fight Wrathion. Void walker as my tank, all buffed up, ring the gong (like in proving grounds) and get yourself ready. He has some attack that the VW soaked up for me. The one item that I had to avoid was the lava pools that he'd spawn. If I pulled them off my VW, the pools would chase me down, getting faster and faster. Stun, aoe pools as quickly as possible. I found standing as the very edge of spell range, I was able to avoid most of the pools. Wrathion runs around the Jade Temple a bit, so you will end up taking down the pools. Second phase, he splits into dozens of spirit doubles, like second dungeon boss of Scholomance. Little AOE (rain of fire) on each and they disappear. Kill a few and they do some aoe damage at roughly 300k-400k health. So cast your AOE, then backup, go back to see how many left. You may have to respawn your VW. Good thing, those duplicates won't move to hunt you down, so sit under Yu'lon and do as you need. When all the spirit doubles are dead, you'll need to have your VW right there to pick up Wrathion again. He runs pretty fast to you if he's not picked up quickly. You win this fight and you're now in the home stretch. Fight all 4 celestials is the final step. I was really happy to hop into oQueue and find a group planning on doing this very quest. There were three (warlock, priest and mage) of us that stuck through all 4 fights, pulling in new people as they dropped from each round. Within the hour, we had all down and legendary cloak on my back. Queue for Garrosh fight and entire chain was complete. Now that I can successfully bridge the gap in Timeless Isles, it's time to take down Ordos. Multiple attempts and then finally, we all stacked at his feet, quickly taken down. While on that side of the island, I realize that there's a chest I haven't opened yet. This chest is deep inside Ordo's sanctuary surrounded by 92 and 93 level elites. After a few attempts I was finally able to access it. When you die on this side, you re-spawn on the green circle. Mounting up here, I was able to run all the way around to the end of the line. Here I died because of all the ordos followers that I've managed to aggro. Soulstone or corpse run and revive in that back corner. From here, I had one summoner (ugh) and one of those giant fire elemental dudes. I had a an alliance mage killing off all the wandering npcs. I only had to kill off the ones immediately around me. Once the ones closest to the chest are taken out, it's possible to open the chest without aggroing anything else. To escape, I ran back out and jump off the cliff into the ocean below. This did net me yet another Burden of Eternity. According to Mr Robot, I used it to replace the 522 necklace that I had been wearing since patch 5.2.